"Hello everybody, I'm the Game Child, real name: George Clooney. A lot of people don't realise that, before I was a famous actor, I was also the first ever officially recognised knock-off handheld console. Since then our good friends in Hong Kong have seen fit to produce countless other pieces of unlicenced tat that allow cheapskates everywhere to experience low cost, retro gaming while enjoying a series of inexplicably poor design choices. ​Look at the below reviews using your eyes, or I'll ruin you like I ruined Christmas!" 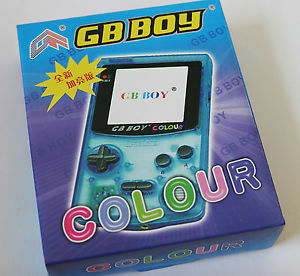 ​Have you ever wanted to play Famicom games on a fake GBA shell using a convoluted and impossible to source converter? Might you enjoy perusing the most incomprehensible instruction manual ever written? Perhaps you merely want to own the console with its own "relevent crazy warning" and a ridiculous name. Congratulations, the Game Theory Admiral awaits you! ​The Game Boy Color's screen was by no means terrible but, as the Gameboy Advance SP demonstrated; its games look all the lovelier when back-lit. Unfortunately, like a priest trying to ride a unicycle, playing GB games on a GBA SP always felt a little awkward and unnatural. Hong Kong manufacturer KongFeng steps in with this solution. Have the Russians finally cracked the tricky issue of Mega Drive/Genesis emulation with this Game Boy Micro style handheld? Do you long for the ability to play a bunch of low quality dot matrix games on a fixed colour background while simulating the daily rigours of being a frustrated checkout clerk? Then have we got the system for you! What happens when you stick 30 "retro" games of dubious originality onto a NES-on-a-chip then bung them all inside a 1.5" screen, palm sized handheld with a Neo Geo Pocket style clicky control stick? Answer: You develop early onset arthritis! 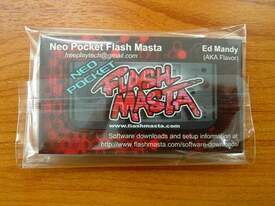 Replacing the Obsolete interface of the original Flash Masta with a modern USB connector brings the Neo Geo Pocket's original flashcart somewhat into the 21st century, but is it too late to keep up with developments elsewhere? Find out in our full review. More unlicensed knock-off system reviews are on their way. Feel free to suggest a system for review in the comments below.